The light. The exquisite light. Low over the eastern horizon, it streams through skyward-reaching arms of jungle trees to set ablaze the 800-year old entrance of the Bayon. Long ago, before the ruins of Angkor were ruins, they had glowed on their own — luminance reflected from gold paint and leaf. A clear sign of the rich Khmer Empire’s indisputable power. 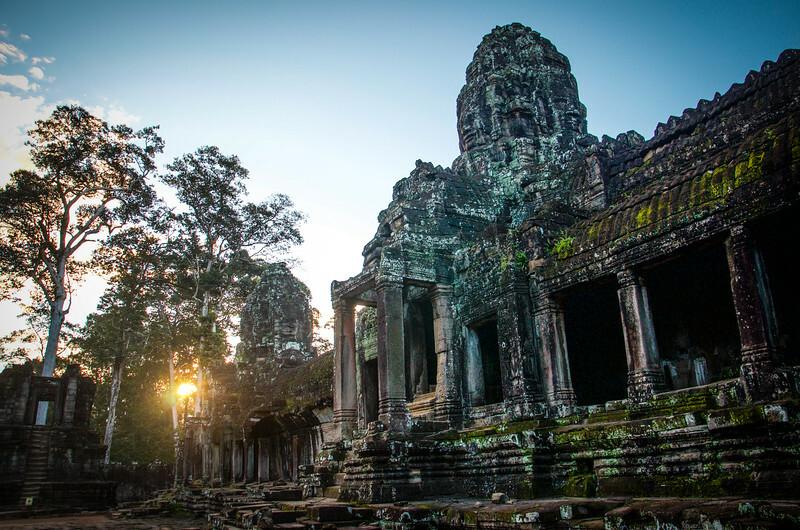 I imagine the eternal rays of the sun are laboring mightily to restore, if for only a moment, the ancient grandeur of Angkor. 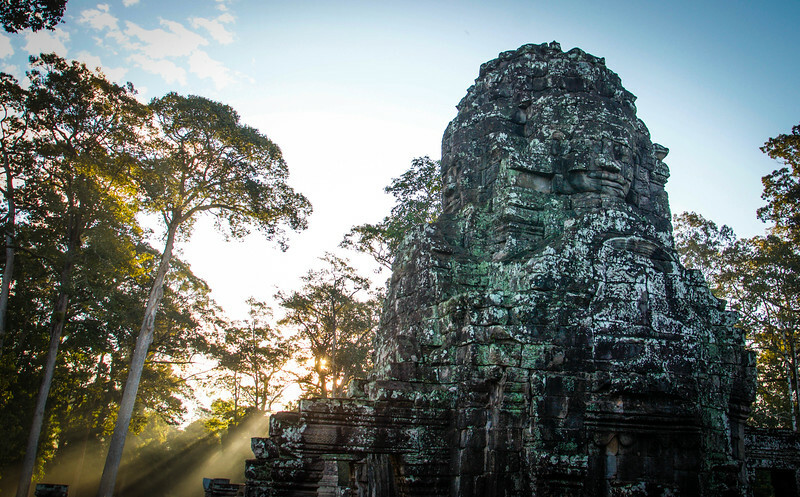 Not only to the Bayon at Angkor Thom, and not just to the world famous “Great City” of Angkor Wat — but also to the thousand other temples that comprise Cambodia’s astounding national pride, one of the greatest UNESCO World Heritage sites on the planet. Standing at the temple threshold, I slowly realize I am the only human being here. My motorbike tuk tuk driver, Mr. Mean (pronounced “Min”, an altogether terrible name for such a nice man) has zoomed away in a cloud of dust to meet me on the opposite end of this series of temples. Somehow I’ve even managed to outrun the hundreds of sunrise-seeking tourists swarmed around Angkor Wat. I feel sneaky and thrilled that I apparently have a head start. The serenity is interrupted only by chattering calls and crashes of exuberant monkeys and tropical birds; they make the dense, humid canopy around me come alive. Feeling a little like Indiana Jones mixed with Florence Nightingale and a hint of Laura Croft: Tomb Raider; an indestructible grin forms on my lips, and I half skip, half march into the ruins to begin exploring. Inside the complex of massive sandstone blocks, I’m greeted by an audience of calm ancient faces chiseled into the rock. 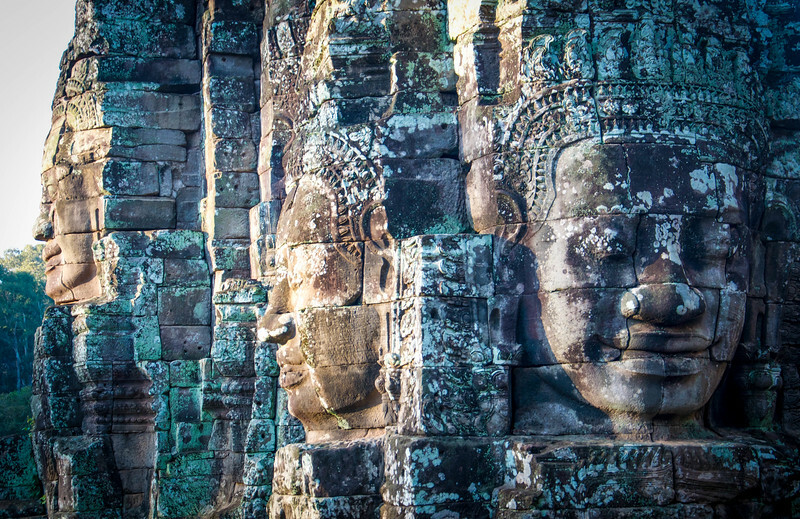 Once used as a palace, army quarters, and administrative center for the kingdom, the Bayon is a life-sized ant farm of narrow passages, towering stone peaks, and crumbling spaces. I weave through echoing doorways and climb up and down decayed stairways. I hang lefts and rights to chase gilded beams of light that seep through crevices and columns. For a while I simply go, happily losing myself both literally and figuratively among the epic remains. Inevitably, small groups of tourists start to trickle in from the direction of Angkor Wat. My exhilarating Indiana Jones fantasy is sadly quashed, and I take this as my cue to exit and hit the temple trail to discover other fascinating ruins. The Khmer Empire officially kicked off at Angkor in 802 AD with the self-declaration of king/god status by Hindu monarch Jayavarman II. For 600 years the empire thrived, expanding into what is now Thailand, Vietnam, and surrounding areas. At its height, the small 390 sq mi Angkor region supported 1% of the entire population of the world. It was home to around a million people at a time when London held only 40,000. Probably the number one reason these Angkor temple cities were so successful was because of water. Ancient engineers used the magic of hydraulics and intricate water systems to store and disperse water for everything from protective moats to pools for religious ceremonies to the irrigation of fields during non-monsoon months. In fact, the breakdown of the eventually over-engineered and over-complicated water systems demanded by the huge population is likely to blame for the site’s ultimate abandonment in the 15th century. 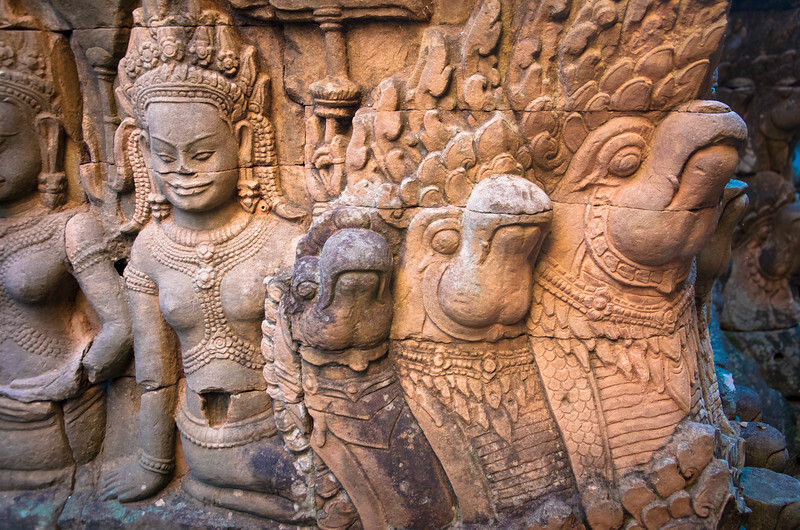 One of the many things that make the temples of Angkor so unique is the incredible amount of bas-relief carvings. 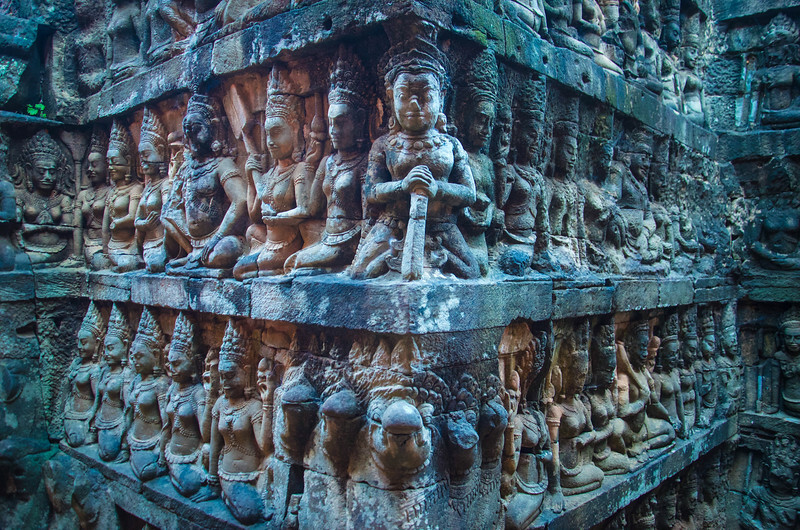 The carvings, which range from Hindu (earlier) to Buddhist (later) in content, were created after the enormous blocks of sandstone were laboriously stacked. That means there was pretty much zero room for error — not a job I would want! Buddhist monks still live at Angkor Wat, helping to keep it and some of the other temples in good repair. Followers of the Buddha can be seen occasionally, making offerings and meditating. As I continue deeper through the relics of Angkor, I begin seeing signs of the perennial battle between nature and humanity. 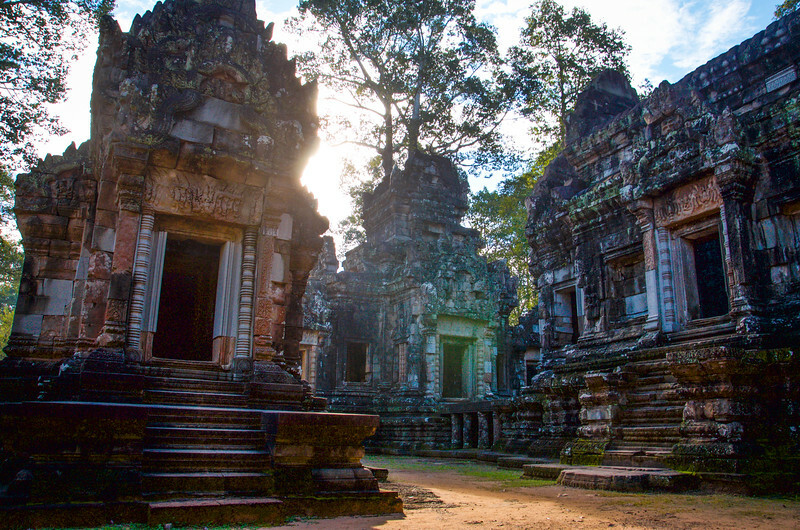 The temples of Preah Khan, Ta Phrom and others are being slowly reclaimed by the jungle. 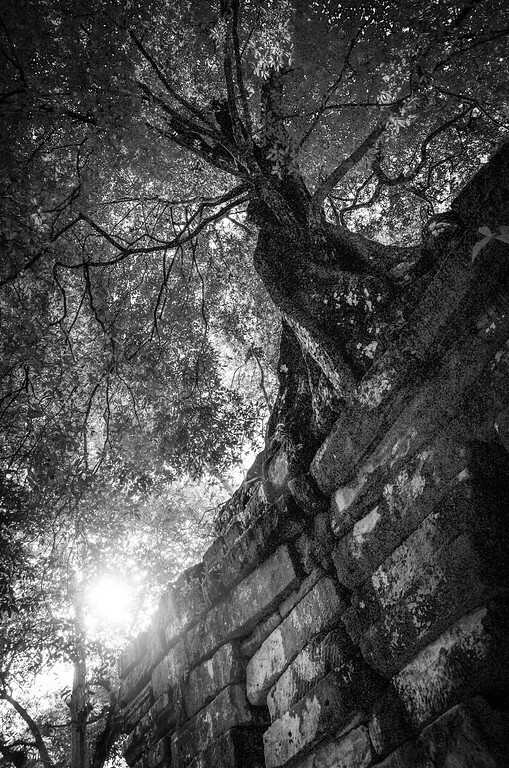 Powerful tree roots grip the beautiful, worn stone structures, forcing them, inch by inch, out of their timeless silhouettes in order to push leafy branches closer to the sun. 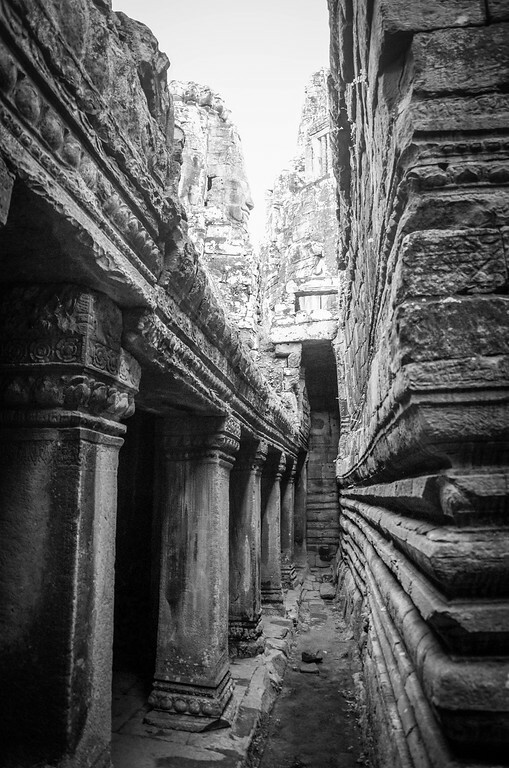 For a moment it makes me sad to think that someday these once mighty temples, along with evidence of the amazing Khmer people who built them, must return to the earth below my feet. The forest has become an unbearable steam bath and I’m ready to find Mr. Mean and get some relief with a nice breezy tuk tuk ride home. I locate him in the parking lot among a congregation of tuk tuks, some with snoozing drivers sprawled across their padded benches. “You have good day, Kree-shin?” asks Mr. Mean as he puts on his dusty gray motorbike helmet. The motorbike is coaxed to life and we roar onto the bumpy dirt road. From the carriage I take a last look at the awe-inspiring temples as we fly past. Late morning sunlight hasn’t just yet relinguished its attempt to breathe atoms of gold back into this extraordinary ancient kingdom. Next stop: Beautiful Bali, Indonesia! Wow! 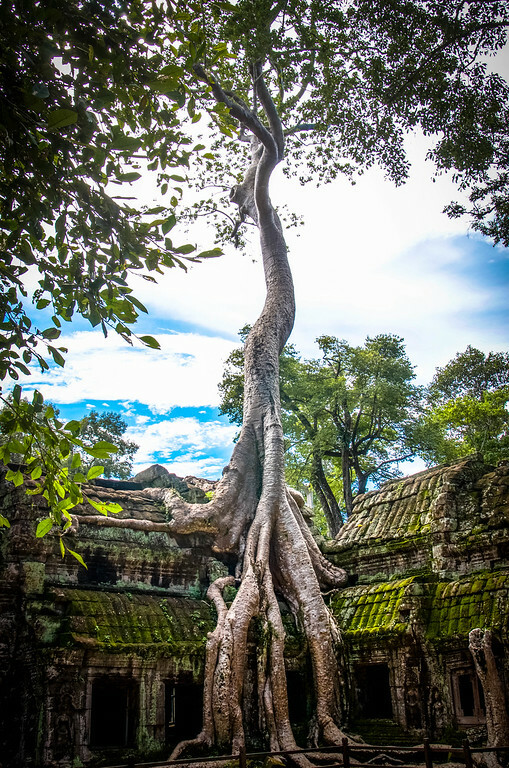 Amazing blog post and photos about Cambodia. 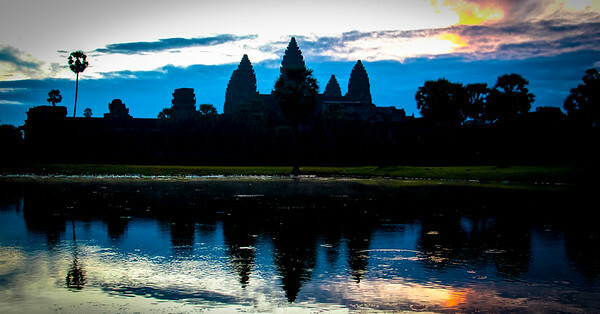 I have not yet been to Cambodia yet, but I will be going there soon with my dad as he was originally from there. All your travel photos and blog posts are amazing!! Thanks for the welcome. I’m not in Cambodia yet and don’t have any blogs posts on Cambodia yet, but I’m going there for the first time this summer. I’m very excited. I’m definitely going to post pictures and vlog about it on wordpress and on my YouTube channel. Wait and see then! I wish you will come to visit Takeo, Cambodia where I live! 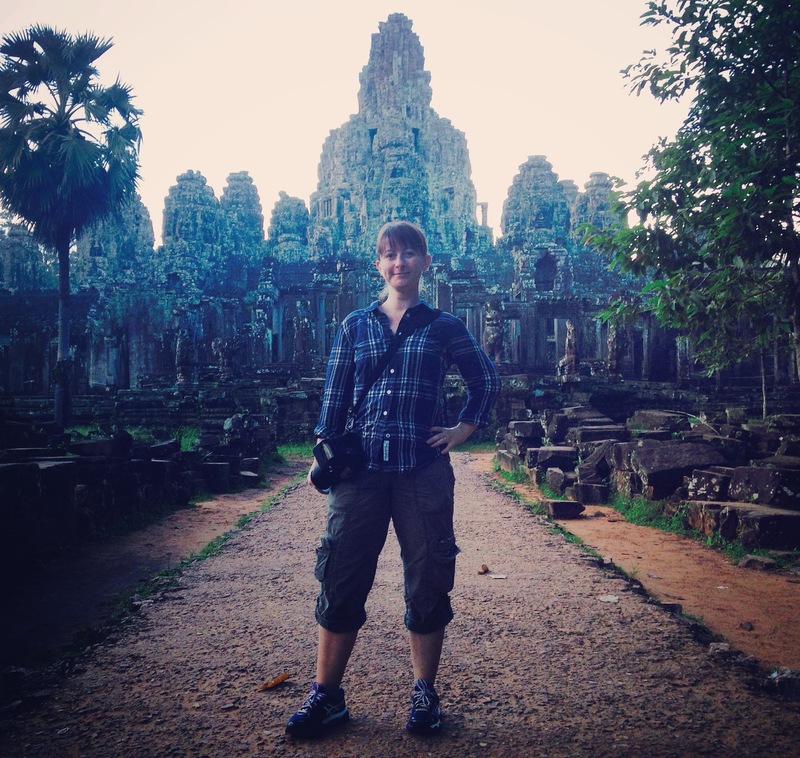 I’ll definitely put Takeo, Cambodia on my itinerary! I heard Takeo is a beautiful place! Anywhere else in Cambodia that you recommend? Yeah, pretty awesome! 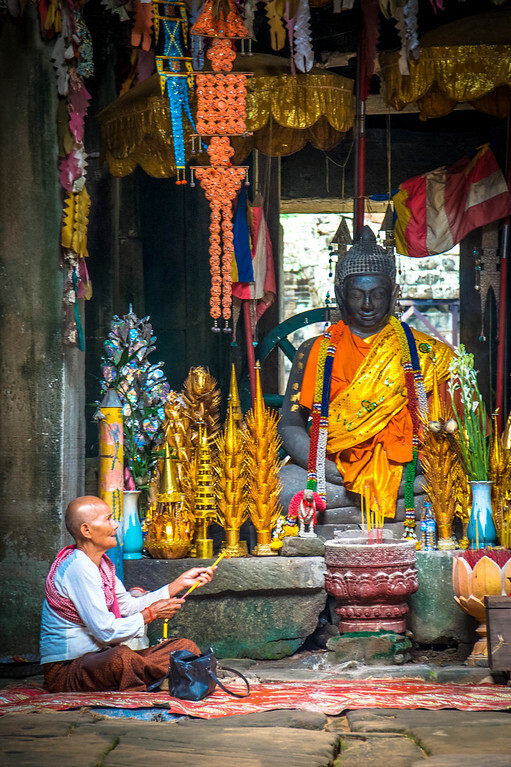 A gain, there is 34 temples in Takeo, one of them is the most popular for tourists it located at Angkorborey District called ” Phnom Da” temple where is referred to as the cradle of Khmer civilisation which is much older than Angkor Wat Temple. It was the capital city during Funan Empire. Anyway, I would recommend you to stay long in Cambodia and visit all tourism sites including Islands, beaches, mountains, rivers, temples, genocide centers, etc., which are so beautiful places for you, I think. You will learn a lot from Cambodia, I am sure you are going to have a great time here! Last, if you want let me know when you arrive Takeo I am pleasure to accompany you to Phnom Da if I am free on that day. Have a nice day! 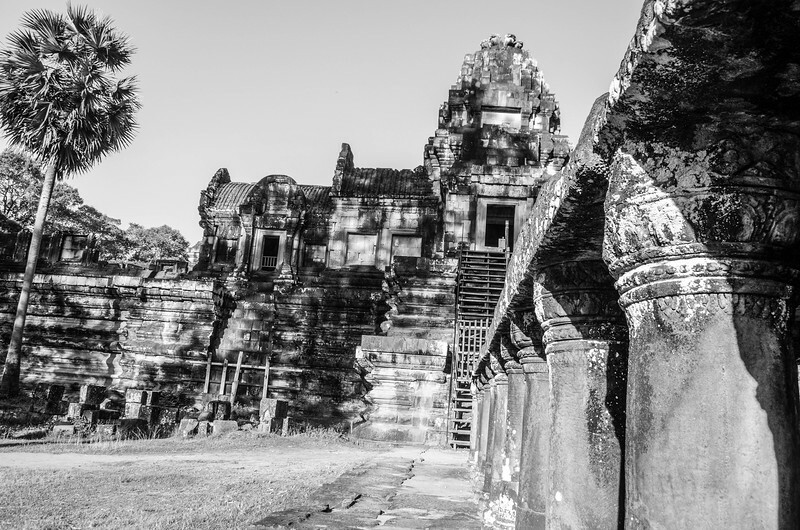 Your beautiful account of time spent in Angkor has me so excited for my own trip there in a couple weeks– thanks for sharing! 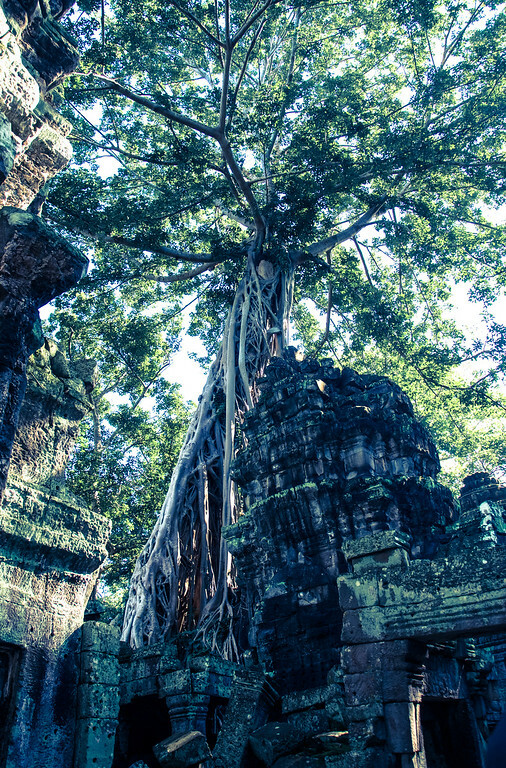 Out of curiosity, how long did you spend in Siem Reap? Also, may I suggest visiting the Buddhist rock-cut caves of ‘Ajanta’ and ‘Ellora’ in Western India? You have to go via Mumbai. Get there fast because the caves are being restricted real fast for public due to damage of the paintings and sculptures. I bet you will love it! Look them up. This is my FAVORITE destination site ever! You will see a Thom face on a painting in Colin’s house after your return to SF. And the very colorful picture in the temple with the buddhist monk inspired two paintings, one oil and one acrylic. Both sold and I will probably don another one soon. Great travel story! Hi WW – Great photos. I mean really. 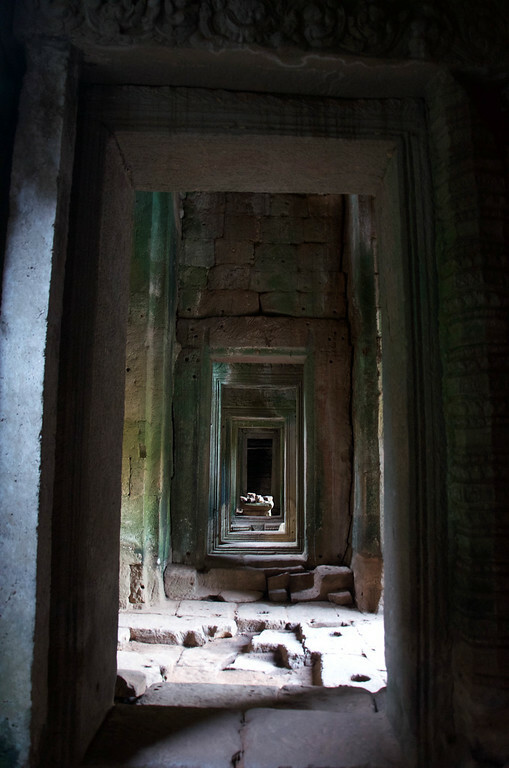 I went to Angkor myself a few years ago and took many of my own but they are no where near as good as these. Nice work!